Tying in with Seminar Two - Maternal Health for TIME UQ's Maternal Health March, come join us next Tuesday to celebrate International Women’s Day (IWD) 2016. Grab a quick bite and help empower women and girls! IWD is a global day celebrating the social, economic, cultural and political achievements of women. The day also marks a call to action for accelerating gender parity. 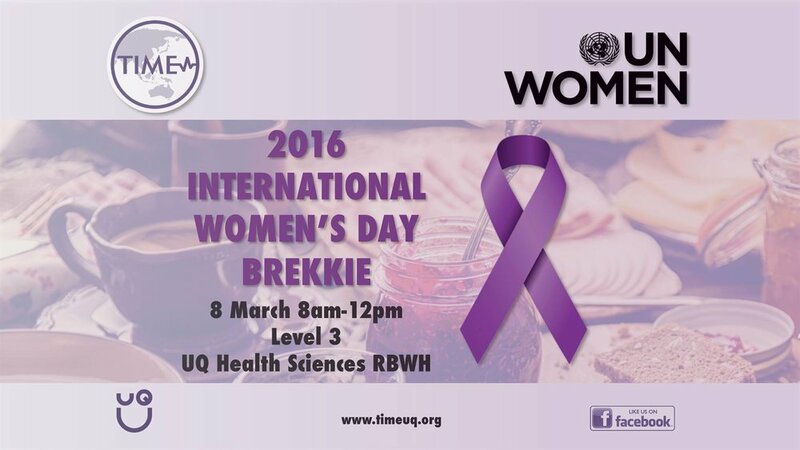 Come drop in for some juice and a muffin, talk to reps from TIME and SWIM, and show your support for women in medicine, and around the world! Gold coin donations will be gratefully accepted and purple IWD ribbons will also be available. Funds raised at this event will go to the UN Women National Committee Australia.